“Cedar Grove successfully recruited participants and worked with them to divert over 154 tons of food waste and compostable materials from landfill." Cedar Grove, supported by a King County Solid Waste Division commercial food waste grant, is conducting a project to increase food waste recycling by restaurants and two farmers markets in King County. A key feature of this project is to focus on diverse communities. The company is working with 17 restaurants, new to food waste composting, whose owners are people of color, foreign-born, and/or whose primary language is not English. Waste audits helped establish baseline measures for volumes of food and compostable materials currently going to landfill that are generated by participating restaurants. 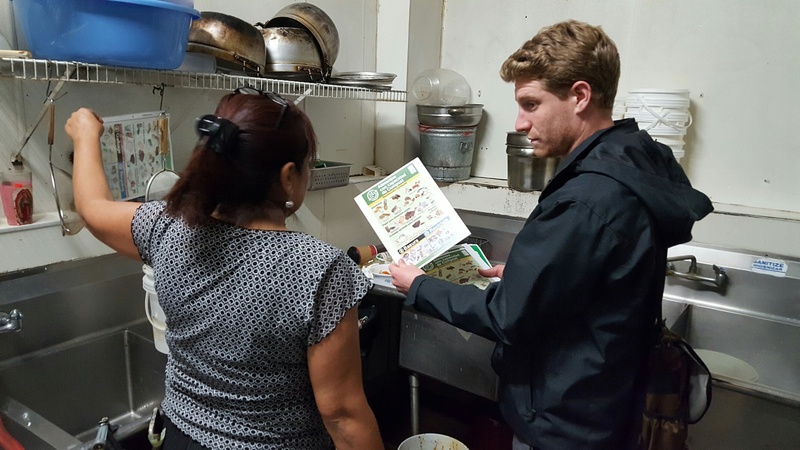 Based on the audits, customized food waste recycling programs were created for each restaurant. Cedar Grove is providing them with education, staff training, and signage to maximize food waste diversion while achieving the highest cost savings from composting, which is less costly than disposing of food and compostable items as garbage. Cedar Grove staff have worked through several key barriers, including language, cost of service and contamination, while establishing signups for food waste collection. Despite these barriers, Cedar Grove successfully recruited participants and worked with them to divert over 154 tons of food waste and compostable materials from landfill. The goal is to divert of a minimum of 70 percent of the waste stream from these restaurants. The project will also work with the Burien and Renton farmers markets this season, providing signage to market vendors and training them on best practices for increasing food waste diversion while avoiding contamination. To learn more about this project or if you are interested in partnering with Cedar Grove, please contact infocg@cgcompost.com.